Ph.D., Marine Zoology, University of Hawaii, Honolulu. B.A., Zoology, University of California, Los Angeles. Classification and biology of tropical marine fishes. Collection and photography of fishes, particularly of coral reefs, in the Indo-Pacific Region. 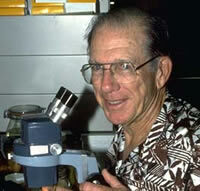 Senior Ichthyologist, Bishop Museum (1984-present). Director, Oceanic Institute, Hawaii (1965-1966). Director, Institute of Marine Biology, University of Puerto Rico (1962-1965). Professor of Zoology, University of Puerto Rico (1961-1965). Randall, J.E., G.R. Allen & R.C. Steene. 1990. Fishes of the Great Barrier Reef and Coral Sea. Crawford House Press, Bathurst, NSW. 507 p., 1243 col. figs. Randall, J.E. & P.C. Heemstra. 1991. Revision of Indo-Pacific groupers (Perciformes: Serranidae: Epinephelinae), with descriptions of five new species. Indo-Pacific Fishes 20: 1-332, 168 figs., 41 color pls. Randall, J.E. & K. van Egmond. 1994. Marine fishes from the Seychelles: 108 new records. Zoologische Verhandelingen 297: 43-83, 71 color figs.